Sensei Fumio Demura 7th dan (Shito-ryu). Interview by David Palumbo. Hiki-te (The withdrawing hand)by Angelo G. Sanna. Maintaining Leg/Body Speed. What is the key? By John Cheetham. Sensei Kase (Steve Cattle Memorial Course). Report by P. Taylor. Relaxation - Speed - Power - Flexibility. by Ian Deavin. Traditional Karate and Trainer Qualifications.By Ken Hollows. Hangetsu 'the neglected kata of Shotokan'. By Steve Cattle. W.S.I. Spring Camp (London).report by John Cheetham. Sun-Dome and Kime. by Malcolm Phipps. 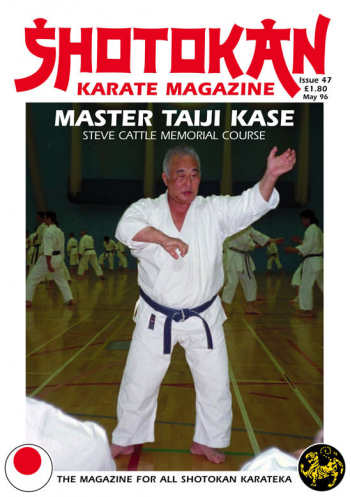 We have a wide variety of articles in this issue and a great interview with one of the worlds most famous and talented Traditional Karate Sensei's, Fumio Demura 7th Dan Shito-Ryu Itosu Kai. I thought it would be interesting to hear the words of a senior instructor from another style of Traditional karate for a change. Of course Shito-Ryu and Shotokan have strong connections especially via Master Itosu a teacher of the founder of Shotokan, Master Gichin Funakoshi. Although Fumio Demura teaches Shito-ryu he has also practiced and studied Shotokan for many years and understands both styles in great depth. 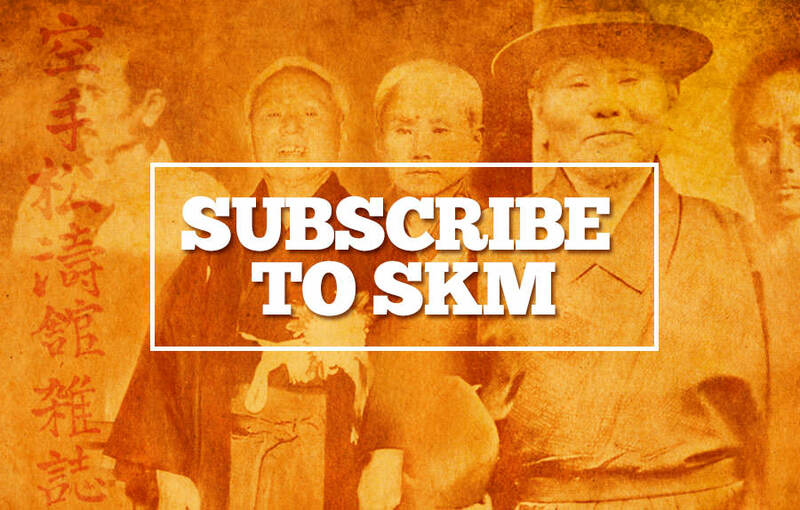 This magazine intends to continue promoting Traditional Shotokan Karate at the highest level and we will continue to feature people from 'all' the many various Shotokan Karate groups, associations, federations and organisations, worldwide. I just had to publish the late Steve Cattle's article on the kata Hangetsu. This is a brilliant description and explanation of Hangetsu and just reaffirms what a tragic loss to the martial arts world Steve's death has been. The man was so knowledgeable in all aspects of the martial arts and his words will live on forever. (Thanks to VMA for the article). Although you may personally disagree (if you are totally traditionally minded) with many of his views and points, the Ken Hollows article has a different angle. As a Professional Sports/Fitness Coach and Karate Instructor, Ken has his own ideas and a few controversial ones! (from a Traditional karate-ka's standpoint). He suggests for instance that Gichin Funakoshi Sensei and Masatoshi Nakayama Sensei's karate, was 'purely' a physical exercise system? I can't see this myself or agree, because they strongly advocated makiwara training and to always be aware of impending danger. The self defence aspect of Karate-Do is stressed in all their books. If it was purely for 'exercise' then how did Nakayama Sensei train and produce formidable fighters/instructors like Kanazawa and Enoeda?? I feel that a lot of Traditional karateka are openminded enough to take on board the good points and advantages of some of the modern training techniques, especially in the areas of injury prevention - body conditioning - safe exercises etc., without losing any of the traditional values or the physical principles behind the techniques. We all know by now, that endless repetitions of technique can cause wear to the joints, but somewhere down the line you just have to do repetition to improve and become familiar with the technique, there is no easy way around that one! All modern sports coaches and athletes prefer and recommend, quality over quantity and have found this produces the best training results. However, the training must be intense! Karate is no exception! Thank goodness for those people, (karateka) who even though, maybe only have time to train twice a week, turn up week after week and 'never' give up (read what Fumio Demura says about giving up!). These people usually train harder, and with more spirit and enthusiasm than those who train every day for a couple of years, then just 'quit' altogether! Editor. MAINTAINING LEG-SPEED, BODY-SPEED WHAT IS THE KEY? By John Cheetham. Correct hip placement for mae geri. Why can the senior Japanese Sensei's - Nishiyama, Kase, Okazaki, Kanazawa, Asai, Enoeda etc., still move so incredibly fast when some are at retiring age? What is the secret of maintaining this leg and body speed well into old age? In this article I hope to look at these points and hopefully find some answers. Many times students will perform techniques which look very good and they may have done a lot of work to get to that stage. However, they often have no conception of the PRINCIPLES of the particular body movement required to deliver the technique. So, the knife hand strike may look good and possibly is quite effective but it was probably thrown and delivered by 'not' using natural principles of body movement. Students can often copy the instructor's movement and to an onlooker the technique will appear the same. The difference will usually be the principles involved in the build up of the movement and not the actual technique thrown e.g. the kick - punch - strike or whatever. "Let us first consider how the human body moves in walking, since in the performance of techniques against an opponent, the body must follow certain principles which are dictated by the manner in which it normally moves. The human body at rest is erect and basically straight. The toes of the feet are in line and the feet are spread to about the width of the shoulders. In this position, one can easily move forward or backward. When one begins to step forward, it is the hips that move first. Note their position: they are slightly forward and the upper body is erect. If the body were tilted sideways, forward, or backward, the position would be unnatural and would hinder movement. In the execution of a lunge punch, for example, the hips move first and the rest of the body naturally follows. In the execution of a front kick, the position of the hip is slightly forward, allowing the body to follow its natural pattern of movement. These examples could actually be seen as a sequence of movements in which the demonstrator begins to move forward, steps into a lunge punch with the left hand, and then follows with a right front kick. In each case, it is possible to move smoothly and efficiently because the hips are held straight, moving forward as the technique begins. This principle of hip movement is a most important one to follow, since anything counter to natural hip movement will result in awkward technique. In addition to the hips moving forward at the inception of technique, the hips should also face in the direction of movement. If the hips were twisted to the side, movement would be awkward; try walking forward in a natural way and it will be obvious that the hips must face in the direction of movement. Thus, when one moves forward in a kicking or punching manoeuvre, the hips should face the opponent directly, since that is the direction in which the body is attempting to travel." The first time I saw the Japanese instructors in this country, in the early 1970's, Sensei's Enoeda, Asano, Tomita, Kawasoe and Kato, I thought..."These people move so fast and incredibly smooth, this is exactly what I want!" I trained on many courses with these instructors. The thing that started to get the message across for me was that their 'speed' of movement was not seemingly based on youthful vigor as with the young competition athletes of the day. This was 'not' the same type of speed (in terms of body-movement) associated with a naturally gifted, young, speedy athlete. It was a technique of body-movement. All the JKA (Japanese) Shotokan people I have seen, the movement is smooth and is instigated from their hips. Their hips definitely lead their shoulders in the forward thrusting motion of the legs, unlike many European Shotokan people I have observed. They just do not have this same technique. This I feel and believe is the key and the reason that all the older Japanese Shotokan people can still move so smoothly and so incredibly fast for their age. They have, through technique, maintained body-speed and especially leg-speed. The whole system is focused on movement coming from the waist down. Hips - lower abdomen - legs and ankles. This gives them the 'speed' of movement instigated from the legs - floor. Westerners have all the upper-body power they need and are a match and more for anyone on that score. Of course westerners are also great athletes, as we have now seen many times, we can beat Japan in competition but this type of speed declines with age. The first thing to 'go' with a soccer player are his legs or rather his leg-speed. This also applies to almost all other physical sports, American Football, Boxing, Tennis etc., the legs go first! Hand and arm speed can be maintained with many people into old age. This has been seen many times. Also upper-body strength can be preserved. You have probably experienced a very strong hand-shake from an old man in your time and been surprised by it. Their grip and arm strength can be very powerful even into their seventies and eighties. 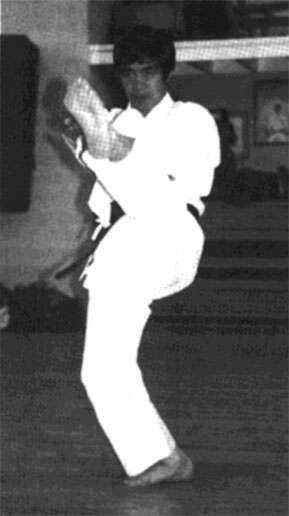 The point of this article is, I believe, that by studying the Shotokan system and body movement - principles as laid down by Nakayama Sensei, it is possible, with constant practice to retain leg-speed well into old age. Whereas other sportsman's legs would be ready for retirement at fifty or possibly be more in tune and ready for a round of golf at the most. Kanazawa Sensei has said..."Karate comes from the legs." Kase Sensei has said..."The secret of karate is, how to move your body." imple enough statements but incredibly difficult to put into practice. A good example would be Kawasoe Sensei, when he taught at our dojo recently, it was his amazing body speed that I was most impressed by. This technique is directly related to Kawasoe Sensei's training at Takushoku University and the Japan Karate Association dojo. It is not magic, it is a specific technique of body-movement and of course applying the correct principles. Hips and ankles play a massive role in this technique, that is for sure. So, it goes without saying that a lot of practice at becoming supple and softer in the hips and ankles (and it is possible) is of paramount importance. I don't think box splits type suppleness means a great deal where this type of training is concerned. It is the speed of hip-turning and speed of the forward thrust of the hips and drive from the ankles that is of the upmost importance here. Kawasoe Sensei says that if you are stiff in the ankles then bend your knees more to get the drive from the floor (external force). Two simple points (principles) seem often to be overlooked. They are both NATURAL movements. As stated earlier in Robin Rielly's explanation of Hip-placement. One is that the hips should remain parallel (to the floor) as in standing up normally where both hips should be in line. That is how they should remain in basic techniques but look in most martial arts magazines and the guy doing the reverse punch (gyaku zuki) has usually dropped the hip (from parallel) on the side of his body which has thrown the punch. eg. If it was a right hand punch the right hip drops. More often than not this is how they look. This is NOT natural, you would not walk like that, with one hip lower than the other, unless there was something medically or physically wrong with you. The key to keeping them (the hips) level, is tucking up the tailbone at the end and bottom of the spine, which in turn tightens the buttocks muscles and lower abdomen and as the Chinese styles tell us this 'centres' you to aid balance and allows for the flow of natural power (Chi - Ki). The second point is natural knee bend, especially in the case of forward stance (zenkutsu dachi) and stepping from forward stance. If you stand up naturally straight (feet about shoulder width apart) and just bend your neck to look at your toes, then naturally bend your knees until they are in line with the toes, this then should be your natural knee bend for forward stance. There should be no need to adjust anything and that should be your front leg (natural) position for forward stance. Pushing the knee out or in is not required, it should be a natural knee bend without any alteration. The back leg also should be well bent even in long-deep stances. It is unatural to have a stiff-locked back leg. Mike Tyson is a great example of deep knee bending to generate massive leverage in his punches. What worries me about the way karate seems to be going is that people are prepared to go to great lengths doing strenuous weight-training workouts to improve strength in their techniques or run for half an hour everyday to improve stamina (which is all excellent training of course) but they are not prepared to study these 'principles' of movement which will improve their 'natural' movement for the rest of their lives. The proof is there to see. Just watch the older Japanese instructors. They are still very, very fast because they move from the hips and lower abdomen (hara) with tremendous drive from the legs. Of course the ankles play a big part in driving from the floor (external force) but this also can be improved with practice. I only wish that I could start all over again knowing what I know now, especially with regard to the principles of body-movement. But it is never too late to improve your movement which in turn can improve your body-speed. You know the old saying - if you want to hit harder then just think - speed - speed - speed and more speed!! A good natural exercise for getting the hips softer and turning quicker is simply to stand up naturally as before and do upper body trunk turns with the hips level and tucked up, keeping the neck and head straight and just turning the trunk from the hips until the shoulder becomes as close to your chin as possible on each turn (each side). You can then relate this natural action to your basic blocks and punch. The part of the turn where your shoulder comes under the chin would be your block and the opposite turn to bring your (level) hips back to square on, would be your punch. If you could recreate this action in a solid forward stance using outside tension of the legs, (as if you are pushing your legs apart in opposite directions from the centre of your body - hara) then you would have a very natural punching action (ROTATION). An interesting point with regard to having a strong, solid stance for delivery of technique was highlighted for me recently when Frank Bruno was completely annihilated in his recent fight with Mike Tyson. Tyson was told by his trainer to simply..."PLANT both feet and start throwing bombs!" It certainly worked for Mike! Stepping forward (as with oie zuki) is a different matter from 'rotation', (gyaku zuki) the principle is 'forward momentum' and here is where the Japanese seem to stay ahead in the speed department as people get older. If you stand at the end of a line of students and watch them step forward with say - oie zuki, you will probably see that the vast majority set off and start their action with a forward movement of the shoulders. If you were watching down the line at a JKA instructors class you would observe the opposite. They would start with the hips leading the shoulders but in a very subtle way, only observable to the trained eye but none the less a fact. Here is the key to the stepping motion which has been a hallmark of their amazing speed in techniques. Lightning fast punches used by the likes of OISHI - YAHARA - KAGAWA - OSAKA spring to mind. When they drive forwards it's as if someone is holding them back from the shoulders and pulling them from the hips. This action was described beautifully by Lee Scott (last issue) as being compared to a 'leaf spring' which I think is a perfect example. The back leg kicks off the action (Kawasoe Sensei says this is the hardest part) and drives the hips forward in conjunction with the (front leg) knee and ankle bend and the front leg takes over utilising the powerful thigh muscles to become the back leg which drives the body forward. This leg action is identical in make-up (although completely different to look at) to a sprinter leaving the blocks. The back heel pushes down first to drive the hips over the front leg which then pulls to become the back leg which drives the athlete forward with incredible speed. There are many different 'principles' involved in karate techniques, Hip placement - Rotation - Forward momentum - Vibration etc. and all these principles have one thing in common, they are 'natural' body movements in tune with the way the human body works and operates for maximum effect. We would all be well advised to study these principles, as well as exercising the body. Obviously, we all need very strong leg/body muscles, which should develop with training but correct use of the 'principles' may be the additional key to maintaining this 'Leg and Body speed'.